The Station of Chilcompton was situated some 14 miles from Bath Green Park Station in the north and 57 miles from Bournemouth West Station in the south. The station, which was just to the south of Midsomer Norton, was some 600 feet above sea level, which often caused problems with snow in the winter. The village of Chilcompton had somewhere between 600 and 800 inhabitants throughout the life of the railway. Other than on the railway or the land the main employers were either at Chilcompton Saw Mills which was adjacent to the railway station or at the New Rock Coal Mine which was close by. 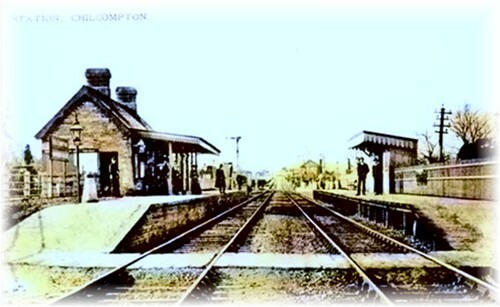 Chilcompton Station was opened on 20th July 1874 and was situated on the south side of the valley of the River Somer. The railway through Chilcompton from Bath to Evercreech Junction was opening as a single line. Following a decision at the S&DJR Officers meeting of 21st Oct 1875 a passing-loop was provided at Chilcompton early in 1876. This resulted in the opening of the first signal-box at Chilcompton, which was the subject of a Board of Trade Inspection report in March 1876. Progressively the section from Midford to Evercreech was doubled between 1886 and 1892. The line from Chilcompton to Binegar was doubled in 1885, and from Chilcompton to Radstock in 1886. In conjunction with this the first signal-box was closed in 1886 and replaced by a Type 2 box mentioned (Board of Trade report dated 14th April 1886). The station was closed with the rest of the line on Saturday 5th March 1966 (The last special trains actually ran the day after on Sunday 6th but the line was closed to normal traffic after service on the Saturday). The second signal box which was opened 1886 and was closed on 11th April 1965. It was built to the standard S&D Type 2 design and was equipped with a 13 lever Stevens Pattern Frame with 4 1/8-inch centres. The signalling at the station was unusual in that no ground signals were provided when the second signal box was built and all shunting was controlled by hand signals. During 1960 the signal box was open between 0640 and 2110 on Mondays to Saturdays and was closed all day on Sundays. The box had a closing switch, which meant trains could pass through the station, when the box was closed as long as access to the goods yard was not required. During the life of the this second signal box brickwork was added to the upper storey under the windows, it is thought this is due to rot or other damage and it is in this condition we have modelled it. The down yard was provided with a goods shed and a 5 ton crane together with two water towers. These were used to replenish the tanks of locomotives used to bank freight trains up the 1 in 50 grade from Radstock to Masbury. For Safety reasons freight trains were banked but passenger trains were piloted thus providing the spectacle of double headed passenger trains. In the 1930’s the sidings at the station were extended to provide a loading dock so coal could be brought by road from the New Rock Colliery. The Colliery was opened in 1819 and was closed on 28th September 1968. It had a 4 ½ feet diameter winding shaft and employed around 200 men. The goods yard had ceased to handle traffic on 15th June 1964. The Club would like to thank Chris Osment, S&DRT Signalling Steward, for helping with some of the above information.